The Metropolitan Copenhagen Heating Transmission Company (CTR) operates the largest district heating system in Denmark. Seven combined heat and power (CHP) and two waste incineration power plants, supported by 14 peak load power plants, supply heat to the CTR transmission system, consisting of over 100 kilometres of mostly underground pipelines with diameters up to 800 mm. Water is pumped around the system at a pressure of 25 Barg and a temperature of 115ºC. Along the transmission pipelines, 29 exchange and pump stations transfer the heat to the local district heating systems, serving more than 250,000 households and nearly one million citizens of five municipal areas of Copenhagen. A problem in an adjacent area recently caused a remotely controlled underground valve chamber to be flooded with very hot water. Although the problem was quickly rectified, all the electric valve actuators installed in the chamber had been completely submerged in the near-boiling water. Subsequent inspection revealed that the robust double-sealed design of the Rotork IQ actuators installed in the chamber had protected them from any damage and maintained the integrity of their IP68 temporarily submersible enclosure specification. By comparison, actuators from another manufacturer had been badly damaged by the effects of the hot water reaching internal electric and electronic components. 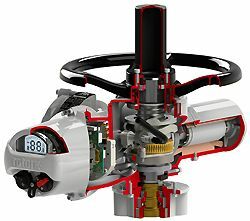 Cutaway drawing of the Rotork IQ3 non-intrusive, intelligent electric valve actuator. Following a thorough precautionary inspection in the workshops of Gustaf Fagerberg A/S, Rotork’s agent in Denmark, the Rotork actuators were re-installed and put back into service. In the meantime, CTR needed to decide what to do about the badly damaged actuators. 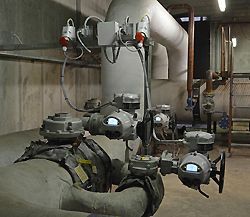 Replacement actuators would be required as soon as possible to minimise potential disruption to routine operations, but integration with the centralised control system demanded the inclusion of special interlocks in each new actuator in order to ensure the correct operational sequence of main and bypass valves. 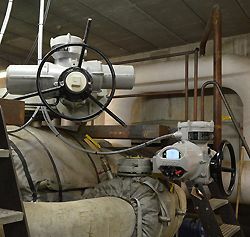 In the valve chamber, the design of the Rotork actuators had proved to be superior by protecting them from the damage that was inflicted on the other actuators. Working with Fagerberg engineers, Rotork produced a wiring diagram with customised interlocks to suit the application and confirmed that new IQ3 actuators meeting this specification could be delivered in less than four weeks. CTR therefore agreed to place an order for the Rotork actuators. Rotork actuators in the valve chamber. The actuator at the top survived the immersion in near-boiling water; the actuator below has replaced an actuator that was permanently damaged by the flooding. In addition to double-sealing, IQ3 actuators incorporate many other features that ensure long term reliability and uninterrupted operation. Secure, non-intrusive wireless commissioning and data transfer, using the hand-held setting tool and easy to follow menus displayed on the actuator screen, mean that once the actuator has been site wired there is no need to remove any electrical covers ever again. Internal electrical and electronic components are permanently protected. Commissioning itself can be performed with or without mains power connected. Piezo torque sensing, unlike disc springs or other mechanical devices, is accurate throughout the life of the actuator and unaffected by the effects of wear on moving parts. A patented absolute encoder, with only four moving parts, provides constant sensing and reporting of valve position, even if the actuator is moved manually with the power disconnected. A sophisticated datalogger stores a huge array of information including profiles of valve torque, operational starts, running times, average torque and an event log. Information can be viewed in real time using the large actuator display window or wirelessly downloaded for analysis on a PC running Rotork Insight2 software for predictive maintenance and asset management purposes. A direct-drive handwheel delivers reliable emergency operation with no risk of damage to internal actuator parts due to the application of excessive force. Finally, the separate thrust base design enables the actuator to be removed completely without affecting the position of the valve. 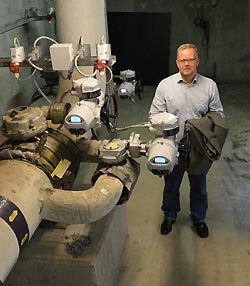 Mr. Lars Haugaard, Maintenance Manager for CTR, with some of the new Rotork IQ3 actuators in the valve chamber.